Emma and Léon spend three days together in a hotel, only leaving the room in the evenings to get dinner on a romantic island. They are completely blissful, and everything they see looks new to them. On their way home from the island, the boatman mentions that he recently took out a big party led by a womanizer with a name he cannot remember – but it is something like Rodolphe. Before Emma goes home, she and Léon agree that they will write each other through Mère Rolet, the wet nurse. Emma is in the happiest stage of her affair with Léon, at the moment that most fully confirms her vision of life and validates her pursuit of joy. But even here, there is a pinprick of doubt, a little bit of rot. The boatman’s story makes Emma realize, however faintly, that Rodolphe lied to her in his letter and probably many other times. There is a flaw in her vision. Tsykynovska, Helen. "Madame Bovary Part 3, Chapter 3." LitCharts. LitCharts LLC, 24 Jul 2014. Web. 17 Apr 2019. Tsykynovska, Helen. "Madame Bovary Part 3, Chapter 3." LitCharts LLC, July 24, 2014. 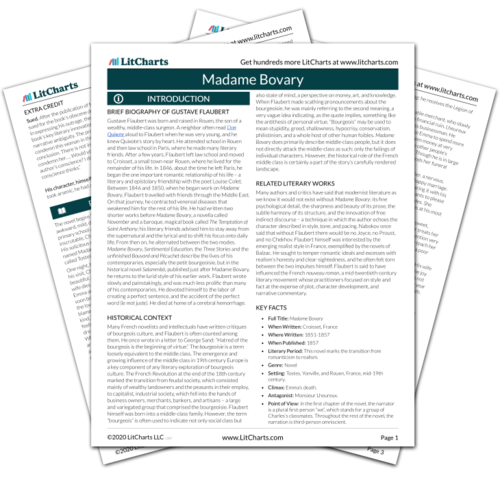 Retrieved April 17, 2019. https://www.litcharts.com/lit/madame-bovary/part-3-chapter-3.